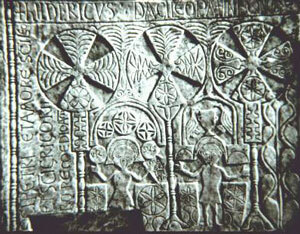 In 568 AD, a Turkic people, the Avars, pushed the Indo-European Lombards out of their home in Central Europe. This was the westernmost edge of a general tendency for Turkic people to take over more of Asia around this time. The Lombards moved south into northern Italy, and conquered it from the Romans who had been ruling there. They conquered most of Italy, but the Romans under Heraclius fought them off from bits of southern Italy. Still the Lombards settled in Italy, and stayed there, ruled by their duces (leaders). The duces (we call them dukes) elected their kings, and they never had an inherited kingship. The Lombards ruled northern Italy for about two hundred years, until the Frankish king Charlemagne conquered them in 774 AD and made them part of his Holy Roman Empire. The Lombards were relatively new to Roman culture, and their leaders were not as educated as most Roman leaders were. Hardly any Lombards could read or write, and they had no interest or respect for old Roman customs, or old Roman buildings. Furthermore, like most of the other northern invaders of this time they were Arian Christians, not Catholics. As a result, much of what remained from antiquity in northern Italy was destroyed during the Lombard period. Cite this page: Carr, K.E. The Lombards – Early Medieval Italy. Quatr.us Study Guides, August 2, 2017. Web. April 19, 2019.